Researchers at LMU report the first biomimetic chemical synthesis of portentol, a natural product found in lichens. The synthesis confirms a biosynthetic hypothesis that explains how portentol is formed in these symbiotic organisms. Lichens are symbiotic partnerships formed between a fungus and an algal or bacterial cell that is capable of photosynthesis. The composite nature of these organisms and their metabolism greatly complicates investigations of their biosynthetic pathways. Dirk Trauner, Professor of Chemical Biology and Genetics at LMU, together with his colleague Dr. Bichu Cheng, have now developed a biomimetic route for the chemical synthesis of portentol, a natural product found in several types of lichens. This result confirms their hypothesis that portentol is produced in nature by means of a remarkable cascade reaction. The results of the study appear in the “Journal of the American Chemical Society” (JACS). 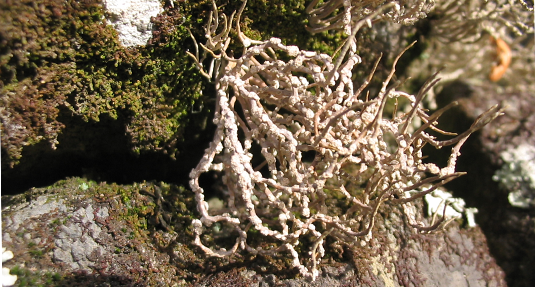 Portentol was originally isolated from the lichen Roccella portentosa in 1967. Although it belongs to a well-known class of compounds known as polyketides, it has a highly unusual and complex structure. The molecule consists of three interlinked rings, two of which are connected by a single shared atom. “Despite these attractive features, relatively little synthetic or biosynthetic work on portentol had been done – until we decided to take a closer look,” says Trauner. “Several possible pathways have been proposed but, as far as we know, portentol or related polyketides have never been synthesized in the laboratory,” says Cheng. So the two chemists decided to start from scratch, and set out to test the novel idea that portentol synthesis involves a so-called cascade reaction that is triggered under acidic conditions.